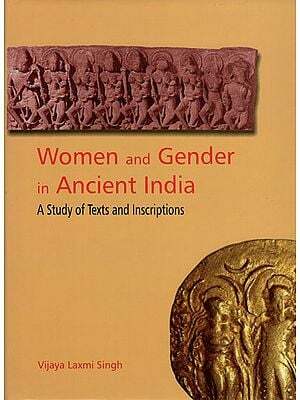 This book concerns the conceptual position of women in early India, specifically the Vedic and early epic periods (c. 1500-200 BCE), and it seeks to make contributions both to Indology and to gender studies. 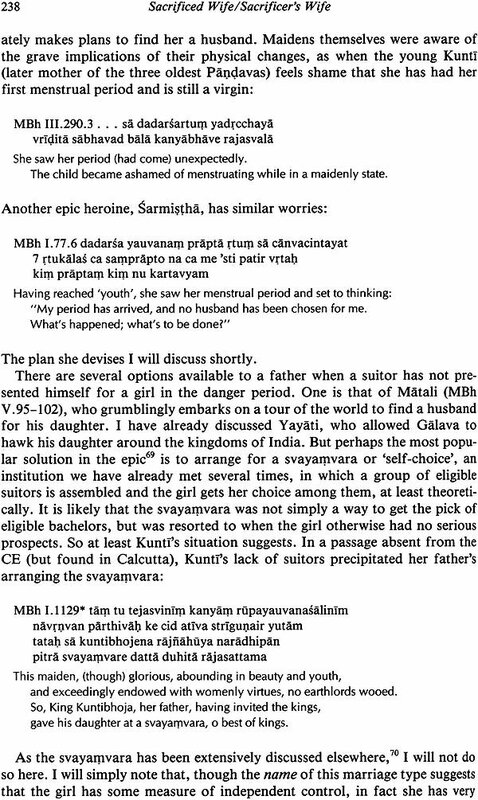 Not designed as an inclusive overview of “Women in ancient India” and all the institutions and attitudes affecting them, it begins rather by focusing on a single, apparently marginal female role- the activities of the “Sacrificer’s Wife” in solemn ritual- and, by extracting the rich materials on her role from the voluminous technical ritual manuals, isolates a set of conceptual functions the wife fills in ritual practice. 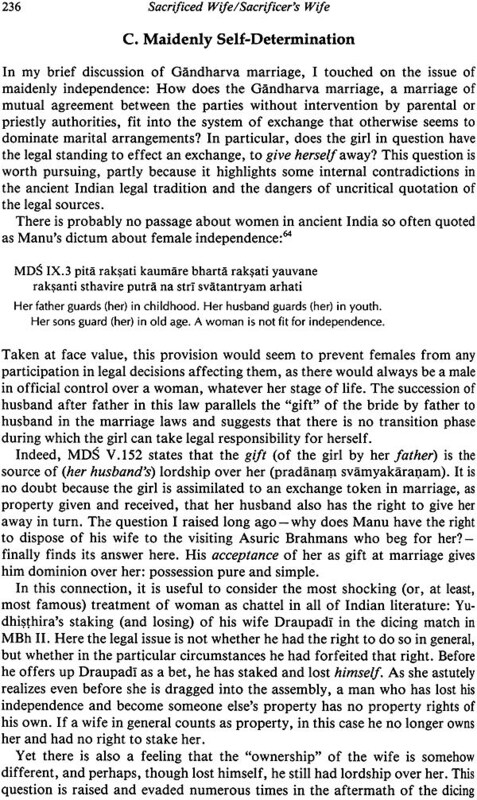 These functions can then be observed in other cultural institutions in which women participate- particularly the system of hospitality and gift exchange that regulated the relations between mutually obligated strangers in ancient India and the system of marital exchange. Besides filling in a large gap in our understanding of ancient India, this work makes a general contribution to the study of women and gender, not merely by supplying information about a place and time poorly represented in these studies, but also by suggesting several methodologies involving sensitivity to language and linguistic analysis to employ in approaching women and gender in other ancient cultures. Stephanie W. Jamison received a Ph. D in linguistics from Yale University, where she studied Indo-European linguistics with a specialty in Vedic Sanskrit. She has taught linguistics and Sanskrit at a variety of universities, including Yale and Harvard, and has published widely on Indo-Iranian linguistics and Vedic and Classical Sanskrit literature and religion. The conceptual universe of ancient India is difficult of access. Though later India has been almost obsessively mapped by anthropologists, folklorists, ethnomusicologists, sociologists, scholars of religion, feminist scholars, and the like, and consequently is reasonably well represented in cross-cultural studies, ancient India - the Vedic and early epic period - remains relatively little known to the wider scholarly world. Even works devoted exclusively to India tend to give a slightly nervous (and often distorting) nod in the direction of the ancient period at the beginning of chapter I and then settle comfortably down to discussion of the familiar. Ancient India remains the province of the philologists - among whom I am proud to number myself. It can only be approached through its texts, and the philological methods employed to investigate these texts may, to the outsider, appear to approach the status of a mystery religion, to be even more esoteric than the contents of the texts they study. As a philologist, a practitioner of this cult, I am certain that the intricacies of the method are necessary. But I also regret the result: that the knowledge we gain too often remains walled off from the rest of the scholarly community, that the process of gaining it is so consuming that we often lack the energy to communicate it to others - and that others will not invest their energy in attending to the unfamiliar details that must be grasped in order to understand the whole. Instead, the picture of ancient India presented by those who do not work primarily in this area tends to be a projection of fantasy, a golden age, or a leaden one, created from shards of later India reflected in a distorting mirror. The relative neglect of this period in the general scholarly literature is particularly unfortunate because it is potentially of such enormous interest. This period of approximately twelve hundred years' provides us with some of the most extensive records extant from any ancient culture. It reflects the turmoil of transition from the small-scale, mobile, pastoral society of the Indo- European peoples who entered northern India to the very different social and political organization of "classical" Indian civilization. It records, with amazing detail, complex religious practice, as well as the religious challenges and accommodations to these challenges that occurred through the period. It establishes canons of knowledge in a number of different areas -law, medicine, statecraft, astronomy, and linguistics, among others. And it does all this in texts often of remarkable literary sophistication and narrative power. This book seeks to make accessible to a wider audience some of the riches that investigation of this period affords us, while at the same time making a contribution to, not merely a secondary distillation from, Vedic and epic studies. As such, it requires a bit of acrobatic balancing on my part and, perhaps at times, some sympathetic indulgence on the part of both of the audiences to which it is directed. To earn this indulgence I will begin by setting forth briefly what the book is about, directly addressing the distinct set of skeptical attitudes each audience will probably have toward this topic and my treatment of it (and toward each other). The general subject of the book is the conceptual position of women in early Indic culture, but it is not designed as an inclusive overview of "Women in ancient India" and all the institutions and attitudes affecting them. 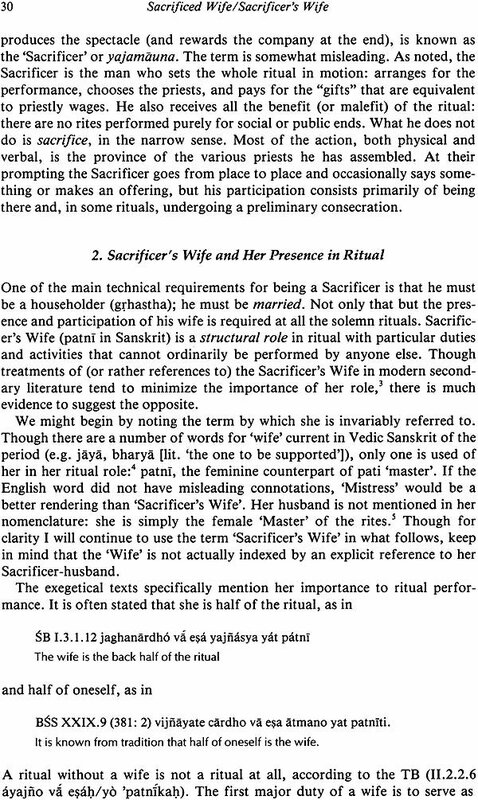 Rather it focuses on a single, apparently marginal female role - the activities of the wife in solemn ritual-and, through an exhaustive treatment of this some- what technical material, isolates a set of conceptual functions the wife fills in ritual practice. These functions can then be observed in other cultural institutions in which women participate. Examining these institutions from this point of view turns out not only to inform us about attitudes toward women and gender but also to force us to reassess radically the nature of the institutions themselves. In addition to filling in a large gap in our understanding of ancient India, this work aims to make a general contribution to the study of women and gender, not merely by supplying information about a place and time poorly represented in these studies, but also by suggesting some methodologies to employ in approaching women and gender in other ancient cultures - new places to look for information and new ways to evaluate it. This' last claim requires me to address the major source of skepticism and doubt that scholars of women and gender will probably raise to my approach: the distrust of texts. I have been told by a number of people that many feminist scholars believe that no trustworthy work can be done on gender issues for cultures we know only or primarily through texts, especially "institutional," not private texts. Ancient India confronts us with this problem in its most acute form, for we possess no other evidence, as we will see when we discuss sources in more detail. Our investigations must all take place in what may seem like the most unpromising of verbal territory: texts preserved by men for men as the foundation and support for an elaborate, well-organized, institutionalized religious system. How can we even hope to glimpse women's experience in these structures, and if we do glimpse something, how can we tell what it represents? We must make the texts tell us things that their composers did not think they were saying; we must read between the lines. Methods for conducting these investigations will be discussed later. In contrast to the feminist scholars' principled distrust of texts, philologists live by them, and most philologists have no doubt that texts will yield secrets when interrogated in the proper fashion. What philologists may question is whether a "proper fashion" of approach is the use of gender as a category of analysis. My philological colleagues are wary of imposing analytic levels between the researcher and the text, of reading the text through a directed lens. We are more comfortable posing what appear to he limited technical questions - what does this word really mean, how is the genitive being used in this passage? Though most of us are aware, at least some of the time, that any question, no matter how innocent it seems, imposes some level of external analysis on the text, some types of questions appear to have more potential to distort the results than others. Questions that appear to be part of a social or political agenda, whether "trendy" or the reverse, seem the most distorting: they may possibly lead to seeing in the text only what the observer expects. The lens of gender may seem a particularly dangerous one: since gender concerns are overtly so little represented in the texts, there is too much opportunity for "creative" and ideological reading of the scanty evidence, with insufficient controls on interpretation. My answer to this is that the philological method itself exerts this control. The very stodginess of the first-order questions we ask of the text tends to rein us in from ideological leaps, forces us to listen to the text, word for word, not impose our mental will on it. But every good philologist also knows that sometimes answering the technical questions requires having first addressed the conceptual and interpretive ones. It is often necessary to understand what a passage is about before one can figure out the grammar, and knowing what it is about means fitting it into the conceptual structures we have created to explain patterns of ideas that recur from passage to passage. Ah, we say, this particular passage makes sense if it concerns the rebirth of the sun - or the three ritual fires - or some other semantic construct abstracted from the comparison of a number of textual passages. In other words, good philological technique often requires the directed lens, the imposition of an analytical level. In paying attention to gender, I simply seek to add to the stock of available conceptual structures, interpretive schemata, and to do so through the application of common philological methodologies: collection, confrontation, and context-sensitive reading of a variety of texts. I am not a theoretician, and I will not engage with the extensive theoretical literature in gender studies - nor that having to do with other concepts, like gift-exchange, that will come up in the course of this work. Let me begin by sketching out what a concern with gender will gain us in analyzing some ancient Indian institutions that are ordinarily discussed with- out reference to gender. This book is in many ways about the relationships obtaining in ancient Indian (Aryan) society, especially the relationships be- tween virtual strangers who nonetheless share societal bonds - between (male) members of the human Aryan community, but also between human beings and their gods, and living humans and their ancestors. 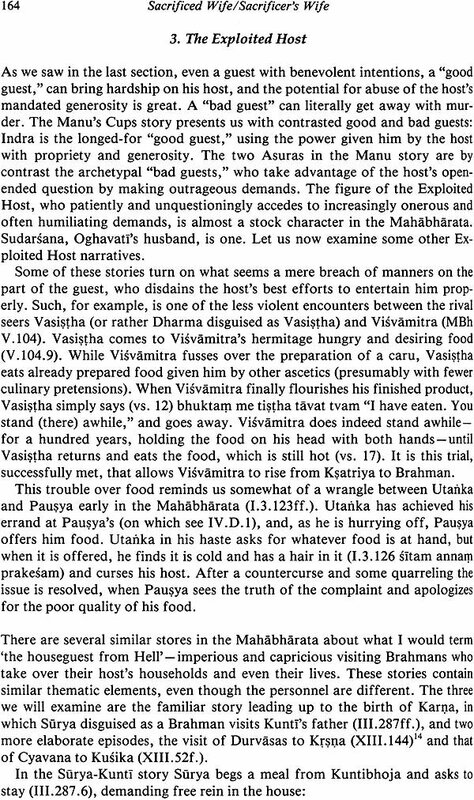 As has been frequently discussed both in specifically Indic and more generally Indo-European context, these relationships are regulated by an elaborate code of guest-friendship, hospitality obligations, carefully calibrated reciprocity, and mutual gift- exchange.' Despite the extensive literature on this subject, several features of these relationships deserve further investigation. First among these is the connection between ritual and hospitality. Though the similarities between the solemn (srauta) ritual of early India and the (human) guest reception required by hospitality obligations have been noted, principally by Thieme," the pervasive parallels between these two institutions, even in nonobvious places, seem to have been insufficiently appreciated. Nor, I think, has proper notice been taken of what must have been the central emotion evoked by these relationships, namely anxiety. The elaborate codes of hospitality exist in order to exert some measure of control over potentially dangerous contact between strangers. Contact between men and gods is even more perilous, since the gods hold most of the cards. 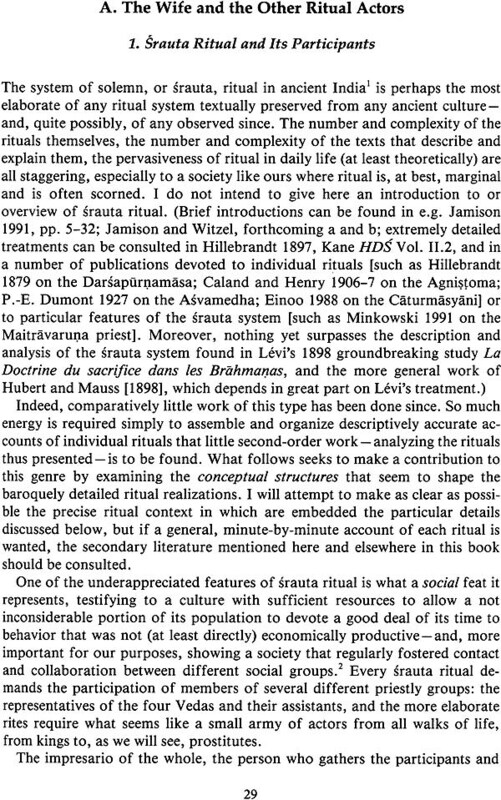 The fantastic intricacy of srauta ritual can be interpreted again as a control mechanism, to regulate the damage that can result from such meetings. The nature of the contact - and its inherent anxieties and rewards - are cast in an interesting and unexpected light when we focus on a figure not usually considered in this connection. Though we tend to think of these relationships as forged between males (and indeed they are, in some sense), the pivotal, mediating figure between the males is frequently a woman. She often dispenses hospitality and, perhaps more important, she is often the means of making alliances - through marriage. She performs this mediating role not only be- tween human males but also between men and gods. Though her activity in the human sphere has occasionally been noted, her linkage of human and divine has heretofore been unnoticed, as far as I know. In the body of the book I will use the woman as a lens to examine anew the crucial relationships that bound Aryan society, and in the process we will learn more about the women themselves and their conceptual position in that society. I will begin (in part II) by examining a brief but emblematic story from the middle Vedic period, whose key figure is a woman and which dramatizes both divine (ritual) and human (narrative) relationships. In certain ways the rest of the book will simply pursue the questions raised by this little tale. 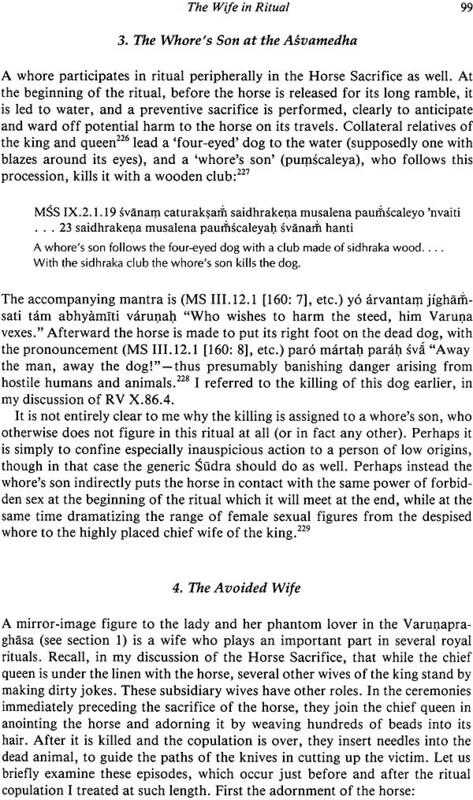 I will then turn, in the heart of the book (part III), to an extended consideration of women's roles in solemn Vedic ritual. 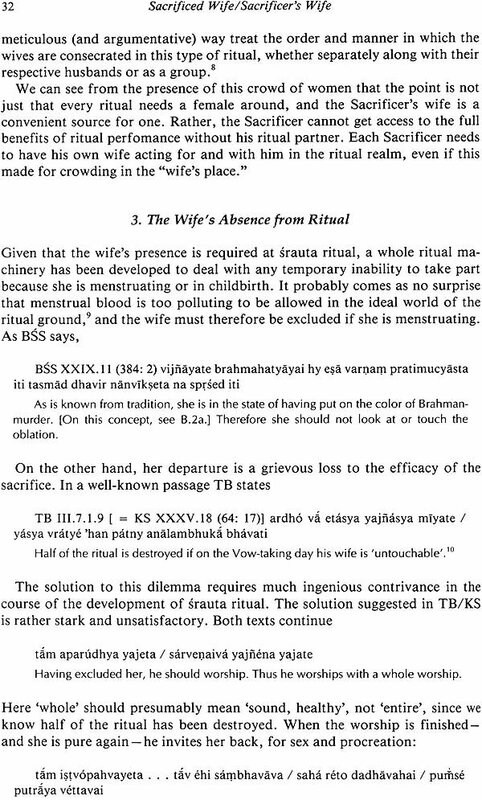 The vast amount of textual material on srauta ritual (to be discussed later) is an almost entirely unutilized resource for the study of women in ancient India, but it presents an ideal laboratory for this investigation. The very constriction of focus, the importance of the forces (gods and divine powers) assembled and unleashed, the removal from everyday life and the practicalities that rule behavior there – all this contributes to a very dramatic and starkly outlined picture of women and their functional roles in a realm where abstract relationships are enacted and encoded. Having formed our views in this world of pure concept, we can then apply them to the messy sprawl of everyday life, primarily as depicted in epic narrative and as regulated in the legal literature. The two areas we will primarily explore here will be that of hospitality and gift-exchange on the one hand (part IV), and marriage (also as an exchange relation) on the other (part V). 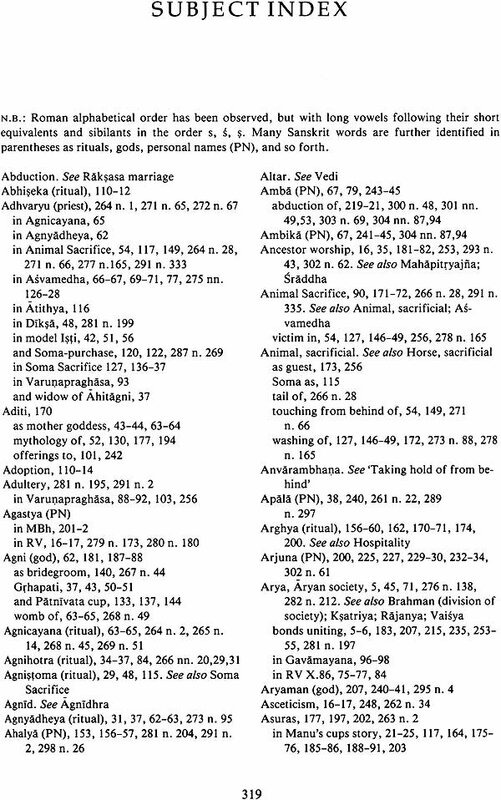 Before embarking on the real topic of the book, however, it is necessary to situate readers unfamiliar with the territory in the universe of ancient India- by giving a brief survey of our sources, some of the methodologies we use to investigate them, and some of the central concepts about women we identify in these sources. What follows is not intended as a general overview of Vedic literature and religion. Such a survey is found in the introduction to my 1991 book, The ravenous hyenas and the wounded sun: Myth and ritual in ancient India, as well as in Jamison and Witzel (forthcoming a and b). Rather, it will concentrate on the types of materials available for gender studies and their problems and possibilities. As I noted above, the problems appear at first glance to be rather serious. First we must acknowledge what we lack, and perhaps first among these is the absence of any utilizable material remains that can be definitely identified with the people of our texts. Our materials are entirely verbal, and so we lack access to the visual, to the sort of imagery and iconography of women and their activities that have been so sensitively interpreted by investigators of other historical periods. There are no pictures, only words. Needless to say, we also completely lack the evidence of direct testimony and observation of women that has made the study of women and gender in non-Western cultures more often an anthropological than an historical enterprise. Moreover, the nature of the texts - indeed their sheer bulk - is the symptom of another problem. The texts are entirely religious (though with "religion" quite broadly' defined), chronicling an elaborate institutional religion, requiring significant material resources and social organization, privileged in its socioeconomic class. The texts owe their preservation to diligent oral transmission over many generations, spanning centuries - indeed, millennia - and the procedures of this oral transmission skew the types of texts preserved. In order to transmit these holy texts unaltered, intricate systems of mnemonic devices were devised that acted as self-checking mechanisms to ensure that not a syllable was lost or changed. These mnemonic devices were only as good as the next generation, however. The transmission of these texts was managed through "schools," passed from teacher to student in each generation. Herein lies the curse of oral tradition from our point of view. Correct transmission required highly structured, quasi-official organizations, with the economic leisure to devote the lives of countless people to the task of being mnemonic automata, impersonal channels of transmission century after century. Such organizations are unlikely to have been in the hands of women, or to include women much if at all. Though we may think of oral traditions as "folky," "informal," "noninstitutional"-hence a potential haven for women's lore-in fact for such a tradition to endure for very long, it must be the opposite: regimented, institutionalized, and purposeful, qualities not likely to be avail- able to groupings of women in the ancient world, especially over many generations.' A text needs to be accepted into this tradition to survive: be orthodox or be forgotten. From the beginning we must face the fact that we are not going to hear an authentic woman's voice-or at least not without tampering by those who have inserted it into the tradition for their own reasons. There will be no forgotten diaries unearthed in the attic, no cache of letters that can serve as a private and direct channel to women's experience. The types of texts often considered especially useful for research on women, those stemming from the "little tradition" and including folklore and religious texts from loosely structured and heterodox sects, were not preserved per se." Folkloric and nonorthodox elements that are found in our preserved texts have no doubt undergone some processes of adaptation to conform better to orthodox norms and aims. Examining more closely the types of texts we do have, we must admit to another series of gaps. For the period in question there are no historical texts- neither narrative history, such as chronicles, nor the historical raw material so ably exploited by social historians in recent years, such as censuses, birth and death records, private contracts, and land grants. So what do we have and what good does it do us? As already noted, all our texts from this period are "religious" texts in some sense, but each type of text illuminates (or obscures) a different aspect-legal, literary, ritual-of that all-encompassing religion. I will describe the two chronologically latest types of texts first, as being the most familiar to nonspecialists. 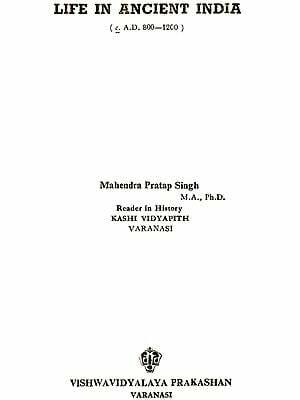 Legal: There exist a number of treatises on dharma or customary law, of which the most famous, though not the earliest, is that of Manu, the Manava Dharma Sastra (MDS). The texts agree in broad outline, in many of their provisions, and often even in wording, but differ (and even contradict each other and themselves) in many details and in the elaboration and length of treatment. The various codes, though not linguistically very old, obviously are reworkings of older, traditional material. 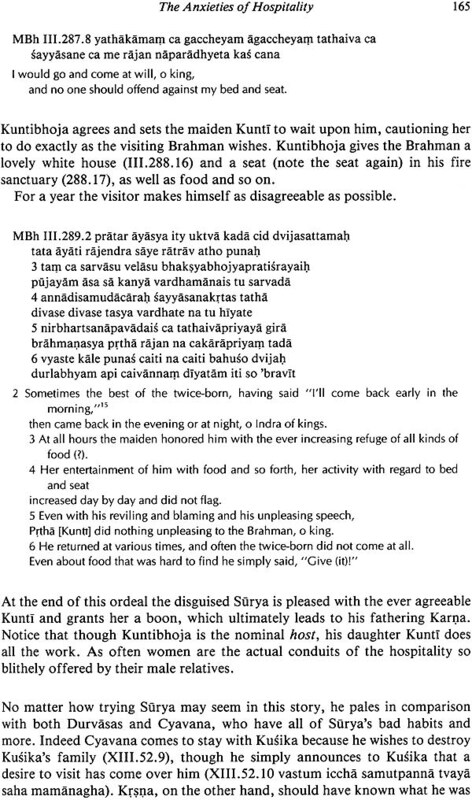 As I have shown elsewhere, we must assume a code with fixed verbal formulae at least by the time of our earliest Sanskrit prose texts (before 1000 B.C.E.). Interestingly enough, the evidence on which I based this argument involves legal provisions affecting women: the killing of a potentially pregnant woman, abortion, and female infanticide. These so-called law codes are not legislative or judicial codes in the ordinary sense. Though penalties, often severe, are set for various infractions, it is not clear exactly what body would judge the case or enforce the sentence. Rather, the texts are idealized codes of conduct; the notion of dharma includes 'duty' as well as 'law', and many aspects of life that we would not consider part of the legal domain are regulated in the codes. Literary: The Sanskrit epics, particularly the Mahabharata (MBh), also traditionally qualify as dharma texts. 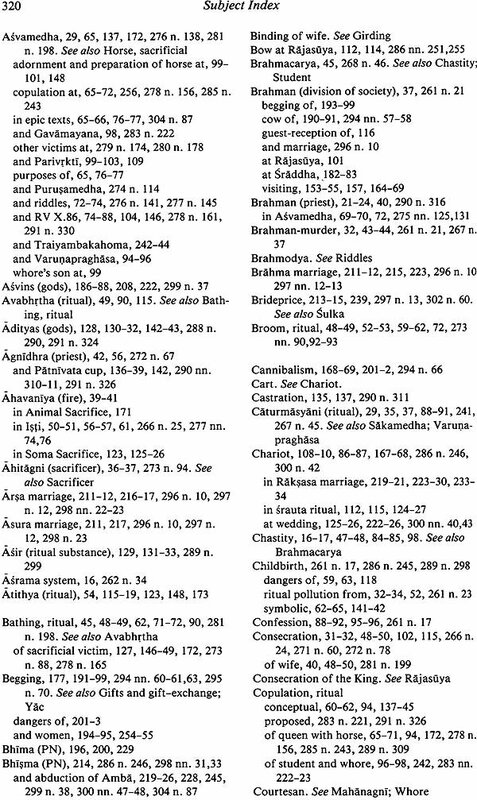 In fact, large parts of the MBh (particularly Books 12 and 13) consist of strings of legal maxims (identical or close to those in the dharma sastras) or learned discussions of legal questions. But more interesting is the use of narratives overtly or covertly to illustrate dharmic issues. The narratives show dharma in action, how law/duty is fulfilled or transgressed in particular cases. These cases are often limiting or difficult ones-illustrating the conflict between two dharmically enjoined actions, the sometimes unfortunate results of dharmic requirements, the gray areas where the application of law is uncertain, the manipulative use of dharmic authority to further morally questionable ends, and so forth. Needless to say, this is not "case law" in any modern sense. We are in the realm of heroic epic, of mythic exaggeration, and in any event the text serves a number of purposes (not the least being entertainment) other than the dry working out of legal puzzles. Nonetheless, it is misleading to read the narratives without an awareness of the legal and religious duties that the participants enact or ignore. 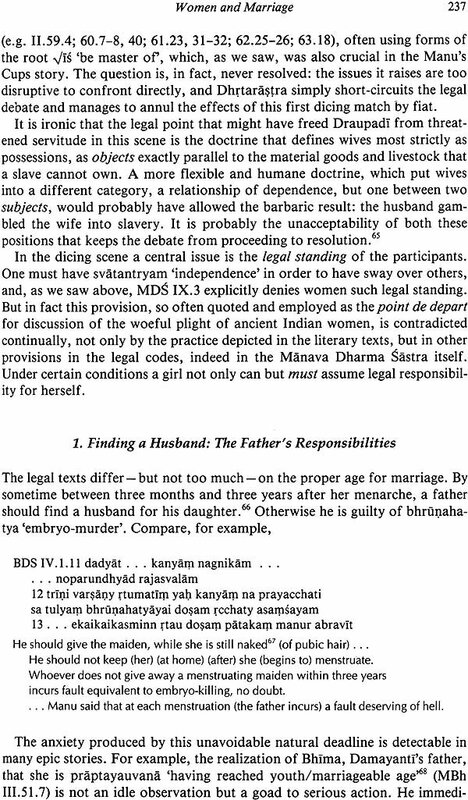 There are a few recent discussions of women in India of which I am aware that make at least some use of the legal and epic material I have just discussed, but almost never in the context of ancient India. 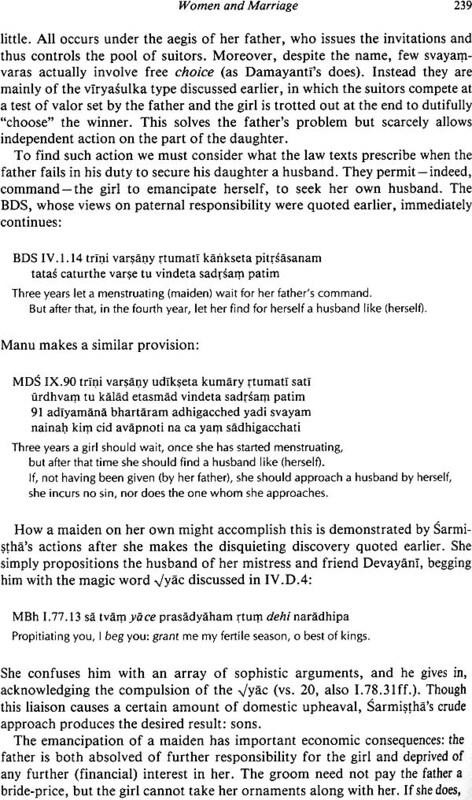 Most such studies are concerned with modern religious practice or at least with classical or medieval Hinduism, and they retrospectively quote the same few verses of Manu on the legal status of women, or the epic stories about the heroines Sita or Savitri, for what they mean or may have meant to a 'culture several hundred to several thousand years later. The disagreements and contradictions within the legal tradition are not addressed, nor is the important interrelation between the idealized rules of conduct in the law codes and the idealized narratives in which dharmic principles are applied. In particular, the epic narratives tend to be treated stripped of their dharmic skeletons. II Though this use of older materials may be illuminating about the attitudes and underlying assumptions of later India, it gives a disappointingly superficial and anachronistic picture of ancient India. Moreover, there is an entire textual type, of vast dimensions, that remains entirely unutilized in this area, that of our oldest texts, the ritual texts. 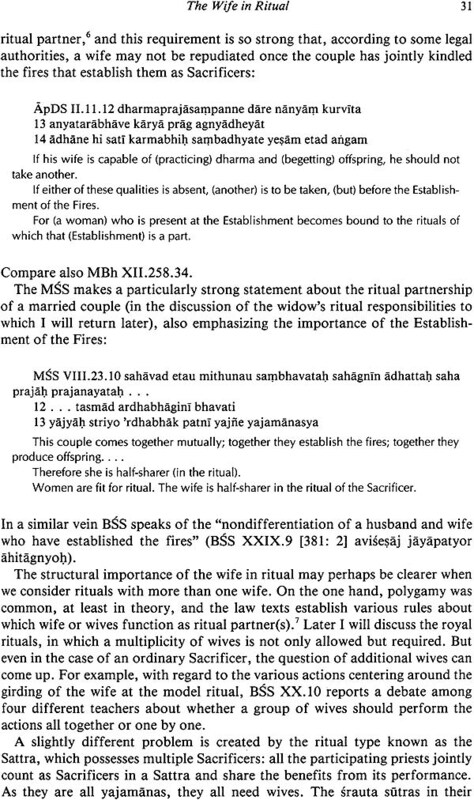 Ritual: Our very earliest texts, the four Vedas themselves," consist of formulae to be pronounced during rituals, not only the solemn semipublic rituals, but also life-cycle rituals (e.g. marriage, funeral, and even such events as the appearance of a baby's first tooth), healing rituals (and those intended to inflict disease), and white and black magic generally (e.g. charms to ensure safe birth, to secure the love of a man). In addition to these ritual-internal texts, we have an enormous body of ritual-external texts, which describe in minute detail every action to be under- taken by every participant in the whole ritual structure. (Vedic India seems to have been about as highly ritually governed as a culture can get, at least in its upper social strata.) 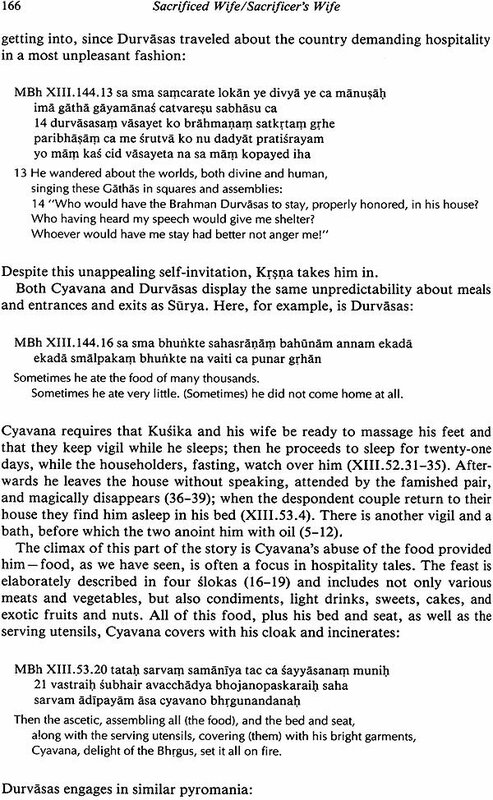 These ritual manuals describe not only the solemn (srauta) rites, requiring a number of priests (in the srauta sutras), but also in the grhya siitras the domestic (grhya) rituals to be performed within the household as a part of daily life and at prescribed stages of life. There is also an earlier stratum of exegetical texts (the Brahmanas) that presuppose the rituals more or less as described in the srauta sutras and comment on the meaning and purpose of various details in the ritual and of individual rituals themselves. Besides providing us with our first Indic theology, these texts are also rich sources of mythological and folkloric material. Now, of course, given the means of textual preservation, these ritual texts do not describe "women's rituals.?" But women are necessary ritual participants not only in the domestic but also in the solemn rites, and their functions and activities in the ritual realm are therefore described on a minute-by-minute basis. Unfortunately these ritual texts are rather inaccessible, or at least difficult to use, for the nonspecialist. Many of them have not been translated, and even for those scholars with some Sanskrit, the language of ritual texts is especially enigmatic and condensed. Even translations do not help much: one needs a familiarity with the seemingly endless minutiae of Vedic ritual to make sense of the details. And in the end it is this fullness of detail that makes the texts so valuable: though women participants do not dominate in ritual performance, the comprehensive and objective" reporting of every ritual action ensures that women's ritual contributions will make their way into the record. 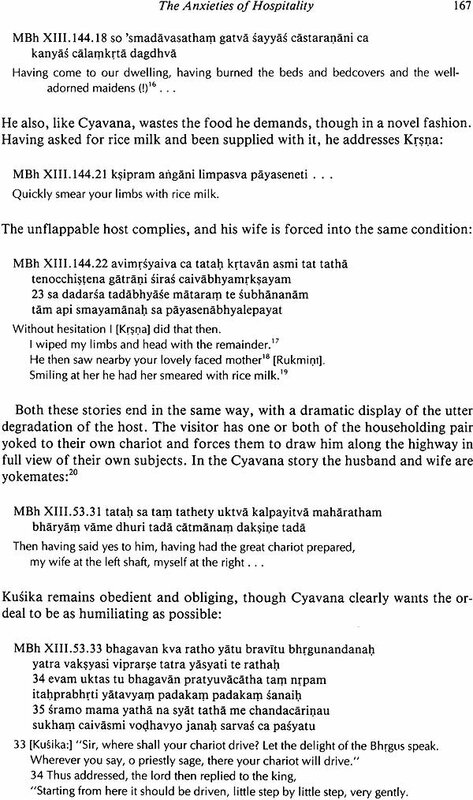 Yet these texts have hardly been exploited for what they can tell US about women in ancient India." This is another reason that this study mines the ritual material so extensively: these are precisely the types of texts that tell us things they do not know they are saying. The women acting in the ritual are not the point of the texts; as we will see, they are fairly marginal at least in terms of the composers' focus. They are neither demonized nor divinized as fictional exemplars so often are. They simply sit in the background, waiting to perform their little tasks - to carry a pot of water or exchange glances with a priest. But when we assemble these little tasks, they produce a remarkably telling conceptual portrait.